"It's really important for me to be at my best. If I can do as well as last year, it would be OK as it would confirm what I can do on this type of race." Warren Barguil took advantage of the presentation of the Sunweb - Giant team yesterday in Osnabrück, Germany, to announce his 2017 goals in an interview with AFP. The Frenchman will target the great classics and stage wins at the Tour de France and maybe try his luck at the Vuelta a Espana where he won two stages in 2013 at his Grand Tour debut in his first professional year and finished eighth overall in 2014. 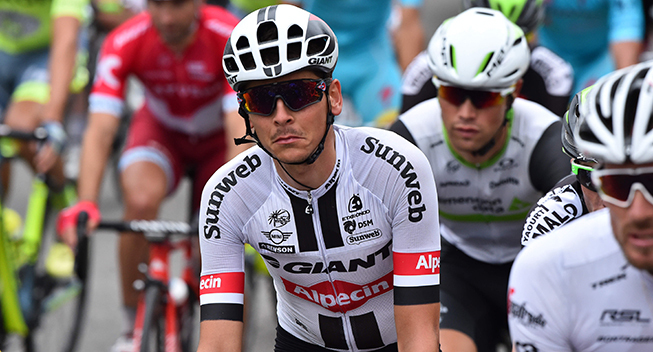 2016 will surely be remembered by Warren Barguil because of the terrible training accident where he and five of his teammates, including John Degenkolb, were hit by a car. With a broken wrist, it could have been worse for Barguil who suffered less servere injuries than the likes of Degenkolb, Chad Haga and Max Walsheid. Having found his form for the Ardennes, he was fifteenth at the Amstel Gold Race, ninth at La Flèche Wallonne and sixth at Liège-Bastogne-Liège confirming aptitudes. "It's really important for me to be at my best. If I can do as well as last year, it would be OK as it would confirm what I can do on this type of race," he told AFP. Another big goal will be the Tour de France, where Barguil will "focus on stage wins" like the rest of the Sunweb team. He confirms that Dumoulin will not do the Giro-Tour double, leaving a lot of freedom to the Frenchman, even though the team will also support Michael Matthews in the sprints. "Then I hope to do the Vuelta and the Giro di Lombardia at the end of the year," concluded Barguil. He skipped the Spanish grand tour in 2015, and in 2016 he abandoned on the third stage due to illness. Barguil then took part in the Tour of Lombardy where he finished 8th in the group of Valverde. Despite these broad draft, his precise schedule for 2017 is not yet known.